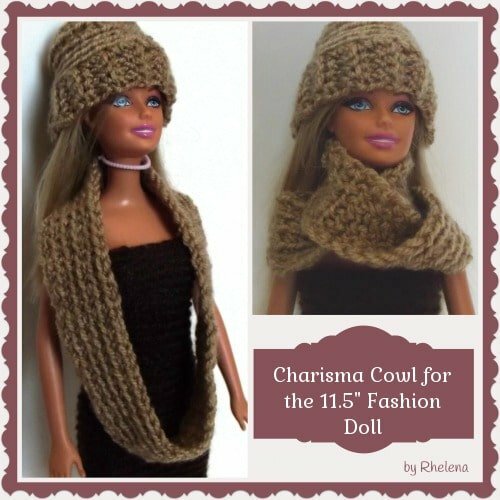 Here is my Charisma Cowl for the fashion doll. I took the exact same pattern and sized it down to fit a doll. The original cowl was done in a chunky yarn, but for this one I decided to use a super fine (1) yarn. And since I basically just copied from my earlier pattern I decided not to have this one tested. So please let me know if you find any mistakes. Thanks so much, and I hope you’ll enjoy this pattern. You might also be interested in this crochet barbie hat, this sun hat, or this hat and cowl set. Yarn: Woolike Yarn by Loops & Threads , (affiliate link) or any super fine (1) yarn. Chains do not count as sts. Ch 60 or any multiple of 2; join with sl st in first ch being careful not to twist chs. Rnds 3-5: Rep rnd 2 until you have reached a desired height. FO at last rnd. This pattern is also available on Craftsy and Ravelry. If you get a chance to crochet this, I’d love to see pics of your finished item. You can share it on the CrochetN’Crafts Facebook page. Visit CPB for more FREE Fashion Doll Crochet Patterns.